Thomas Dewell serves as co-editor for the News&Guide and managing editor for the Daily. He also contributes stories and photos, designs and copy edits pages and posts stories to the web. He serves on the business’s marketing council and website design and implementation team. He is a past president of the Wyoming Press Association and current member of the Wyoming Press Association Foundation board. A graduate of University of California, Santa Barbara, Dewell started in newspapers as an intern at The Santa Barbara Independent. At the Jackson Hole Guide, he climbed from reporter to editor. 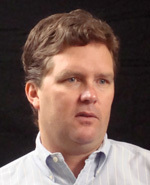 He became a partner and co-editor when the News and Guide merged in 2002. His volunteer work includes helping Spanish-speaking middle school students with their studies. He lives in Wilson, Wyo., with his family, two-horses, two-cats, a dog and 12 chickens. Thomas Dewell was a young court reporter when a woman made him a jaw-dropping offer he elected to refuse. The incident helped him realize the size of the stakes when you report on people’s lives. Click here to view a transcript of this interview. Copyright © 2015 Valid Sources, Inc. All rights reserved.